He sees us when we're sleeping, he knows when we're awake. And this time of year he likes to hang out at malls, parties and parades, for goodness sake. Good thing the guy likes to be high profile right now, too, because there are millions of kids eager to spend just a few minutes sitting on his lap and whispering in his ear. 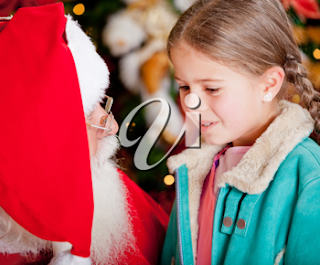 A child's annual visit with Santa Claus is an image that warms my heart time and time again. That wary, wide-eyed stare of the tiny tot just before he bursts into tears, the coy bowed head of the introvert, the excited glee of the extrovert are photo-worthy moments that just never get tired. The barely contained enthusiasm of energetic youngsters waiting for the big guy's arrival at the end of the annual parade is a better photo op than anything else along the route. In this jaded society, there is probably no greater vision of innocence and wonder than the eyes of a child at this time of year. Sure, some may say it's all about materialism and must-have. But, that's not what I see when I look at a little one's face as they visit with Santa. What I see is a belief in magic, that good things still do happen, that dreams can come true. And sometimes, let's be honest, that Santa can be just a little scary.